For the town in Pennsylvania, see Palmyra, Pennsylvania. For the island, see Palmyra Atoll. Palmyra was an ancient Arabian city in central Syria. 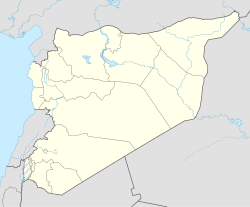 It is in an oasis 215 kilometres (134 miles) northeast of Damascus, and 180 km (110 mi) southwest of the Euphrates. It was an important city in ancient times. It had long been a place for travellers to stop when crossing the Syrian Desert. The city was founded some time during the 2nd millennium BC. It became abandoned around 1929. The site was made a World Heritage Site by UNESCO in 1980. The Semitic name of the city is Tadmur (Arabic: تدمر‎). In Aramaic, it means "a city that cannot be defeated". The earliest written reference to the city by this name is on Babylonian tablets found in Mari. It is still known as Tadmur in Arabic. The people of Palmyra worshipped many gods and goddesses from Mesopotamia, Syria, Arabia and Greece. They built a series of temples and large monuments containing funerary art, or art representing the dead. Palmyrans originally spoke Aramaic, but later began speaking Greek. The area was later made a part of the Roman Empire. Between the years 260 and 273, Odaenathus and his wife Zenobia used Palmyra as the capital of the Palmyrene Empire. This period of history is called the Crisis of the Third Century. By the time of the Muslim conquests, several Arab tribes were living in Palmyra. The city lost its importance after the 16th century. It was fully abandoned by 1929, during the Ottoman Empire. There is a new town of the same name nearby to the south of the ruins. ↑ "Tadmor: Syria". Geographical Names. Retrieved 2011-09-24. ↑ "Tedmor: Syria (ancient site)". Geographical Names. Retrieved 2011-09-24. ↑ Teixidor, Javier (1979). The pantheon of Palmyra. Brill Archive. p. 34, 59, 62. ISBN 978-90-04-05987-0. ↑ "Tedmor: Syria (populated place)". Geographical Names. Retrieved 2011-09-24. This page was last changed on 2 June 2018, at 06:28.